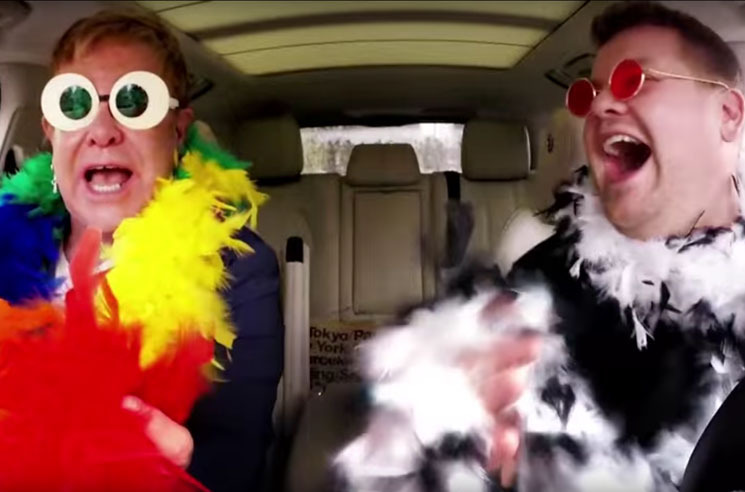 Elton John Joins James Corden for "Carpool Karaoke"
The Late Late Show with James Corden has found viral video success with the "Carpool Karaoke" segment thanks to appearances by superstars like Adele and Chris Martin, and now another high-profile Brit has joined Corden in the car to belt out some classics. Elton John appeared on the show's latest instalment, which sees the singer and late-night host cruising around Los Angeles singing along to some of John's finest hits. "Your Song," "I'm Still Standing," "Crocodile Rock" and "Tiny Dancer" make the cut, as do "Don't Let the Sun Go Down on Me" and Lion King favourite "The Circle of Life." They take a couple breathers to discuss John's impressive career, dress up in some colourful costumes and shout out up-and-coming artists like Grimes. Watch the fun clip in the player below.